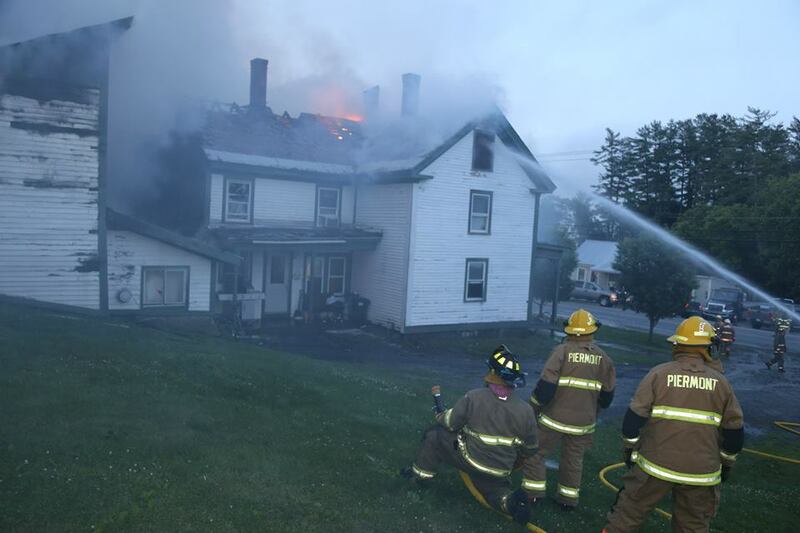 Vermont fire officials say juveniles starting fires in and around a garage started the fire at172 South Main Street in Bradford, Monday night. Bradford Fire department found a two level garage, storage section and back portion of the South Main Street residence fully involved upon their arrival shortly after 8pm. Mutual Aid fire companies from VT and NH helped battle blaze for close to four hours. Damages to the structure owned by Robert Nutting are estimated to be over $200,000. Vermont State Police say this is a reminder for parents and caregivers to speak to children of all ages about the dangers and risks associated with fire. A Vermont man who escaped police custody in Windsor VT on Tuesday was captured a short time later in Claremont. Police say Corey Briggs 34 of Brownsville VT escaped from a back window of the Windsor Police Department just after 11:30 am. New Hampshire State Police were notified and supplied with a booking photo of Briggs and information that he may be traveling in red Mustang. While searching Route 12A in Claremont for Briggs, Trooper Michael J. McLaughlin saw a man matching Briggs description walking along the road. McLaughlin took Briggs into custody without incident. The red Ford Mustang was found and was driven by a female driver. Briggs was treated for a minor injury he sustained prior to being taken into custody. He as then transported to the Sullivan County House of Corrections pending his arraignment. Vermont State Police are looking for the driver who left the scene of an accident that sent a Royalton VT man to the hospital. Police say upon arrival they found a black VW Jetta in the center of VT 107 and a white Subaru operated by Tavian Mayer 63, on its side in the Locust Creek Outfitters parking lot. Witnesses say they saw the male driver of the Jetta flee into the woods but police were unable to locate him. Mr. Mayer was taken to DHMC in Lebanon where he is currently in serious but stable condition. Mayer’s 2007 Subaru was totaled and the Jetta received front-end damage. Anyone with information on this crash and the driver, or anyone who witnessed it is asked to call the Vermont State Police Royalton Barracks, Trooper Blais at 802-234-9933. The Claremont Police Department is seeking re-accreditation. On June 28, a team of assessors from the Commission on Accreditation for Law Enforcement Agencies, Inc. (CALEA) will examine all aspects of the Claremont Police Department’s policies and procedures, management, operations and support services. The Claremont Police Department has to comply with 188 standards in order to maintain its accreditation status. Police Chief Scott said” CALEA’s standards seek to establish the best professional practices, and address: One – life, health and safety issues; Two – critical legal issues; And three – conditions that reduce risk.” and high liability exposure”. As part of the on-site assessment, agency personnel and members of the community are invited to offer comments at a public information session on Monday, June 29, at 7:00 pm at the Claremont Savings Bank Community Center. Claremont is one of 12 accredited police departments in NH.